d. Players are allowed to wear school jersey’s and pants (except for the team cap) if they are coming directly from a school game. 4. Each game will be 7 innings. However, you cannot start a new inning after 2 hours and 15 minutes has elapsed. You may complete an inning if it has already started and is now beyond the 2.5 hour time limit. a. If the game is tied after 7 innings an 8th inning may be played with time permitting based on the rule above. d. Mercy rule: 12 runs ahead after 4.5 innings if the home team is winning and 5 complete innings if the visiting team is winning. e. A game is considered complete after 4.5 innings if the home team is ahead or 5 innings if the home team is behind. If the 6th is started but not completed the game reverts to the prior inning. If the game ends due to the time limit or darkness it is an official game. 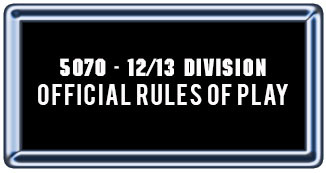 i. Playoff exception: Games must go a full 7-innings to be considered official with the exception of the mercy rule (4.d) which still applies. i. Playoff exception: Games cannot end in a tie. Games still tied after 8 full innings or that reach the standard time limit (whichever comes first) are considered suspended and must be completed the next day. Managers should follow the process in (5) for suspended games. 7. Players cannot sit out more than one inning in a row and must play at least 4 innings in the field (7 inning game). 11. Any player that warms up a pitcher either before an inning or in between innings must wear a protective mask. 12. Pitch count/inning rules can be found in the MBSA Pitching Rule Supplement. Specific division rules supersede the supplement. a. Standard pitch count rest rules apply and can be found in the pitching supplement. b. Pitcher can pitch a maximum of 7 innings per game and 7 innings per week and is subjected to the pitch count and rest rules. The baseball week begins on a Sunday and ends on Saturday. c. If the pitcher hits 2 batters the same inning or 3 in the same game the pitcher must be removed. 13. A manager or coach may make two trips to any one pitcher in any one inning. On the third trip that pitcher must be replaced. The pitcher can take any other position but may not pitch again in that game. 14. The batter is allowed try and advance to first base on a dropped third strike. Standard rules apply. 15. Intentional walks are permitted. The pitcher must pitch to complete the walk. 17. Balks: One warning per pitcher per inning will be given. A second infraction will result in a balk. Under no circumstances can a runner score on a balk. 19. With two outs, a Manager should put in a courtesy runner for a player currently running the bases and is scheduled to play the position of catcher the next . inning to keep the game moving. The runner must be the last batted out. 20. The team on offense should have a 1st and 3rd base coach. The manager may appoint a third coach to manage the bench. Players serving as base coaches must wear batting helmets. 21. If there is going to be a play at a base (except going into first) the player MUST SLIDE. b. Runners must slide or avoid except for home where sliding is mandatory. Runners that do not slide will be called out. c. Sliding headfirst is allowed except for home plate. d. If a runner slides headfirst at home he will be called out. e. No barreling by a runner or fielder is allowed. A warning will be given the first time. 2 occurrences by the same player during the same game will result in the player being ejected for the remainder of the game. When the runner is the offender an automatic out will result. When the fielder is the offender the runner is safe. 23. There is no bat throwing at any time. If a player throws a bat, there must be a warning given. After the warning, please notify the parent. 24. Ask your parents if they want their child to wear a caged helmet prior to the start of the season. If a caged helmet is worn it is replaced by a standard helmet if the batter reaches base. 25. Only approved little league bats may be used (max barrel size 2.”). Any bats not meeting this specification must be removed from play immediately. . A list of approved bats can be found on our website. 26. The team on offense should have a 1st and 3rd base coach. The manager may appoint a third coach to manage the bench. The manager has the option of allowing one player to coach a base. The player must wear a batting helmet when coaching a base. 27. Home team shall always use the first base dugout. 28. Batters, base runners and player base coaches MUST wear helmets. 29. Any player charging the mound will be ejected from the game. 30. Let parents know they need to get to the field 15-20 minutes prior to game time. All coaches and managers should be on time as well. As they get older, warm up period becomes more and more important. On a caught infield fly, a runner must tag up (i.e., retouch, at or after the time the fly ball is first touched by a fielder, the base the runner held at the time of pitch) to be eligible to advance, as on any catch. If the infield fly falls to fair ground untouched, or is touched and dropped, runners need not tag up. In either case, because the batter is out, the force play on other runners is removed.